Sendai is the largest city in the Northern part of Japan’s main island. Sendai has all the modern conveniences of a city like Tokyo or Osaka, but it’s also a great jumping off point to explore more scenic and rural Japan too. In fact, Matsushima, a beautiful costal town less than an hour north of Sendai has one of Japan’s most scenic views. 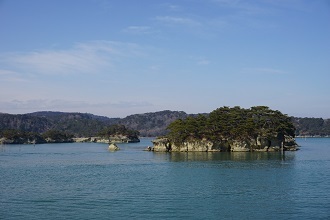 Matsushima bay contains over 200 islands which are covered in costal pine trees. Sendai itself is famous for Gyutan, or Beef tongue. This dish is a must-try for anyone who visits Sendai city. There’s even a Gyutan Street located in Sendai Station where you can try Gyutan from all of Sendai’s most famous restaurants! Sendai is also home to one of the most famous festivals in Japan, the Sendai Tanabata Matsuri. Every year, from August 6-8, thousands of colorful streamers are put up to decorate the city. According to legend, two gods in the sky are separated by the milky way and are only allowed to meet up once a year during Tanabata. During the Tanabata Festival, you can eat special festival foods and enjoy the beautiful decorations! What does a school manager do at AEON? The manager is the top position at the school. Managers are responsible for everything that happens at the school. Customer service, advertising, office work, etc., which means everything except teaching. Even the smallest things are a part of the job. Running a school successfully requires good teamwork between the management and the teachers. For example, in the interview for a prospective student the teacher is the key for that person to know what AEON is like in only a few minutes. Before the interview, the manager shares some information with the teacher about the prospective student and what he or she is looking for from their English studies and the teacher does the interview to suit that person. The success of these interviews leads to an increase in the number of students. Also, as teachers know their students best in the classroom, teachers and managers communicate daily so that the manager can give each student specific advice to help them achieve their English goal. What does the future of English education look like in Japan? In Japan now, there is a lot of demand for English and the expected level of proficiency that is getting higher and higher. Also, it has to be practical English. Native speakers might think “What is practical English?” Until about a decade ago, English didn’t have to be practical and could be a hobby that you can enjoy. It was even considered as something that the wealthier people are interested in, to use when they are travelling or just for fun. But, currently, many Japanese companies are encouraging their employees to take the TOEIC to test their English proficiency and some are making their operating language into English. English is beginning to be something that inevitable and is considered as a common thing that people should be able to speak.